Audi iPhone and iPod integration kit installations, sat nav and DVD. Parking sensor retrofits, air bag module repairs. Audi factory radio, GPS repairs and refits. Come to Cartronics and find out how your iPod or iPhone should sound in a Audi. You will get CD quality audio, steering wheel controls and song and artist info displayed right on your radio. Audi chip tuning? We do that too, impressive speed and power gains for your post 1998 Audi. Customers from across the UK bring their Audi to Cartronics for quality ICE and AV installations while you wait. This customer wanted to retrofit Bluetooth into their Audio R8. We ensured that the Bluetooth was fully integrated with the original sat navigation and steering wheel controls for a seamless experience. The driver can now connect their iPhone or Android phone to their Audi R8 with ease. Cartronics fitted a Rosen DVD Entertianment system in an Audi Q7. Check out images of installation and learn more. 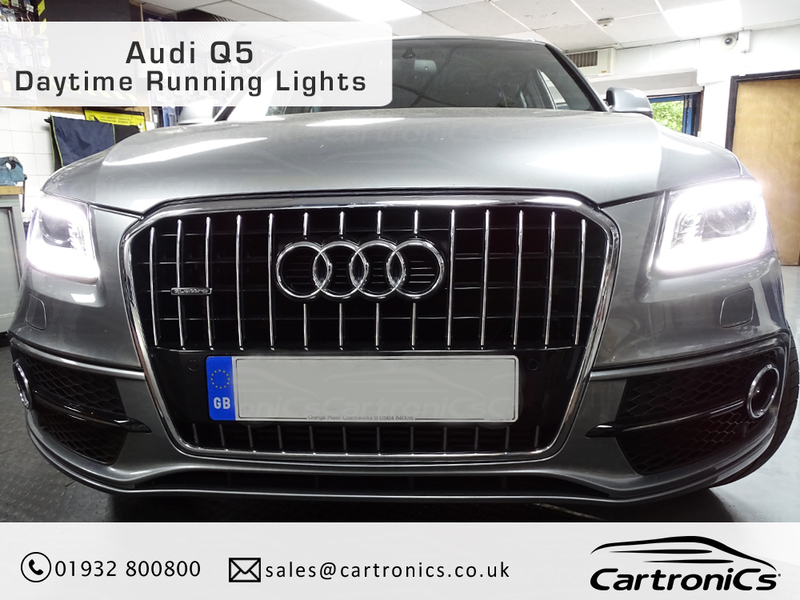 If you want to upgrade your daytime running lights in your Q5, we've got you covered. Latest DA3 DSP pre-amp installed to any Audi - read more. This Audi Q7 customer wanted to retrofit navigation into his vehicle. This Audi A8 customer had a fault with his radio and navigation system which is a factory fitted Audi MMI system. On this Audi S3 we did a complete audio upgrade. Some examples of our Audi retrofits, audio and navigation upgrades.